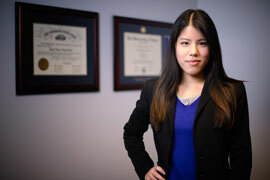 In 2012, Ms. Tran joined HCP, where she practices in the general litigation and medical malpractice groups. Her practice areas include personal injury, premises liability, and construction litigation. She also represents clients in the medical industry, such a doctors, nurses, hospitals, and other healthcare professionals. Ms. Tran has handled numerous cases from inception. She has experience in trials and has successfully argued cases before courts of appeals across Ohio. She was recently recognized by Super Lawyers as a 2018 Ohio Rising Star. Ms. Tran earned her Juris Doctorate from the University of Akron School of Law. While in law school, she served as the Editor-in-Chief of four journals, including the Akron Law Review, Akron Tax Journal, Akron Intellectual Property Journal, and the Akron Online Journal of Constitutional Law and Policy. She was one of four students selected for publication in the Akron Law Review, and published Recognizing an Academic Freedom Exception to the Garcetti Limitation on the First Amendment Right to Free Speech, 45 Akron. L. Rev. 945 (2012). She received the CALI Award for Excellence for the highest grade in Insurance Law and Constitutional Law. She was a member of the nationally acclaimed Mock Trial Team, and competed across the country. She was also a research assistant, and an officer of the Asian Latino Law Students Association. Ms. Tran is passionate about educating our youth and currently volunteers as the head coach for the Archbishop Hoban High School Mock Trial Team. When away from the office, she enjoys hiking, photography, reading, and gardening.